Script name bracelet by Jennifer Creel. Customize with any name or word, up to 10 characters. Please note: Customized Jennifer Creel pendants cannot be returned, and these special orders cannot be canceled. Please allow up to 10 business days for the shipment process. 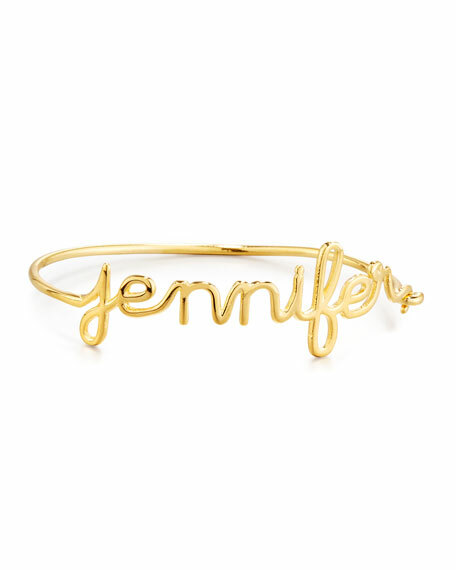 To fulfill her own desire for more personalized jewelry options, Jennifer Creel founded her brand in 2008 (after 12 years as a womenswear designer at Ralph Lauren). Built on the New York-based designer's belief that jewelry should "tell a story about a person's life," pieces are classic with a modern bent. EXCLUSIVELY AT NEIMAN MARCUS Alex and Ani bracelets with gift box. 14-karat gold plated sterling silver. Chain bracelet with curved arrow. Chain bracelet with evil eye drop. Braided bracelet with crystal. Set includes three bracelets. Arrives in box ready to gift. Made in USA. EXCLUSIVELY AT NEIMAN MARCUS Alex and Ani bracelets with gift box. Sterling silver with 14-karat gold plating. Pull-cord bracelet with integrated heart. Braided bracelet with east-west arrow. Swarovski?? crystal pearl cuff bracelet. Set includes three bracelets. Arrives in box ready to gift. Made in USA.